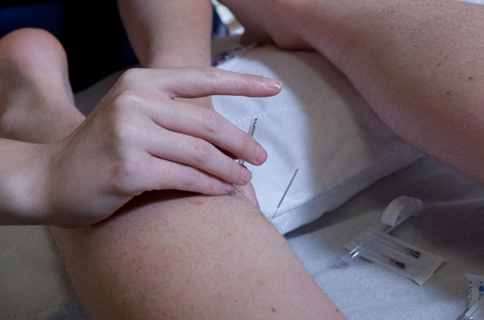 Dry needling is a form of therapy in which fine needles are inserted into specific points on the body to relieve pain. This is a very successful medical treatment which uses very thin needles without any medication (a dry needle) to achieve its aim. This is used to treat pain and dysfunction caused by muscle problems, sinus trouble, headaches, and some nerve problems. It is not all the same as acupuncture. Acupuncture is part of Traditional Chinese medicine, whereas dry needling is a western medicine technique. Dry needling works by changing the way your body senses pain (Neurological effects), and by helping the body heal stubborn muscle spasm associated with trigger points (myofascial effects). There are additional electrical and chemical changes associated with dry needling therapy which assist in the healing process. All our therapists at Athboy physiotherapy and sports clinic have completed post graduate training in dry needling therapy and have been practicing this form of treatment for a number of years.